Books4Everyone has recently discovered they have many books without an author listed. They want a component on the lower right corner of the home page to make sure these books can be updated quickly. Just like before, they provide you with the SQL. Here's the SQL query they gave you. You know that in SOQL we will write it like this. Now, add the SOQL query to the Apex controller. In the Developer console, open the Books4EveryoneHomeController Apex class. Once again, create a new Lightning component for the Home page. Close any open tabs in the Developer console and then choose File > New > Lightning Component. Name your new Lightning component Books4EveryoneMissingAuthors. Inside the aura:component tabs, add the following code. Click Controller on the right side of the page to create a controller for your component. Save all your open tabs. Our final step is to ensure our query worked as expected by adding our component to our homepage. 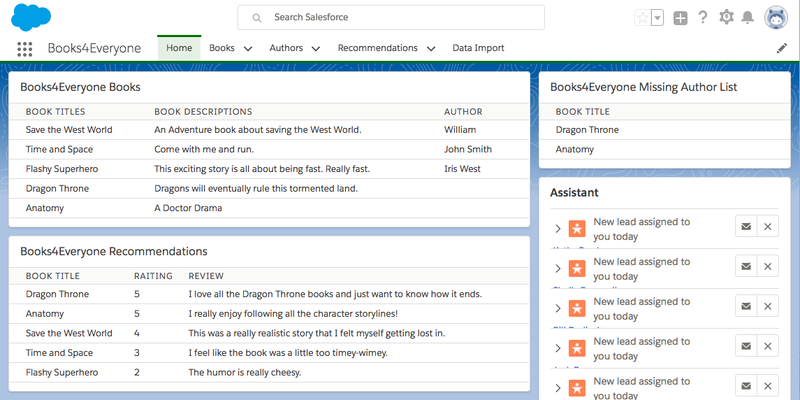 On the left side of the Lightning app builder, find Books4EveryoneMissingAuthors in the list of custom components. Drag the component to the top right panel on the page. Click Save and then Back to return to the Home page.